Rock the dock with us! The Rivergods make our debut at Captain Scotts Lobster Dock in New London on Saturday, June 30 from 6-9pm. Free show, BYOB, come enjoy the music and some of the best local seafood in the area. We’re looking forward to this one! Check out our videos page for more videos from the night. As many of you have surely heard, our friend Steve Kaika, bass player of the seminal New London band The Reducers passed away this week after a courageous battle with lung cancer. This Friday, June 15, the Rivergods join fellow New London bands Dogbite, Ken Atkins & the Honkytonk Kind and the Original Sinners for a memorial benefit concert at the Hygienic Art Park in New London, CT. Doors open at 6:00pm, with the music starting at 7pm. The Rivergods will close the show. A $10 donation is suggested, with all proceeds going to benefit Steve’s family. RIP Steve, we will never forget your sly smile, your amazing bass lines, and incredible 35 year contribution to the New London music scene. More info on the benefit can be found at The Reducers‘ website, with some really great tribute articles to Steve. Saturday, June 23rd The Rivergods return to Summer Pops in Westerly w/ our good friends Carl and Jay Franklin of the Franklin Brothers, Wilcox Park, Westerly, Rhode Island. 6:30 pm. Don’t miss it! Saturday, June 30th The Rivergods play at Captain Scott’s Lobster Dock in New London, CT. Come sit by the water and enjoy great food and entertainment. 6-9 pm. BYOB. Friday, July 6th Ben and Nancy will perform at the 6th annual Everyone’s Diggin’ Dylan concert, part of the Small Town Concert Series. Show starts at 8 pm. 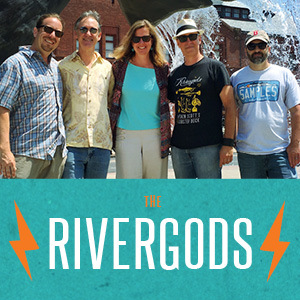 Katherine Hepburn Cultural Arts Center, Old Saybrook, CT.
Saturday, July 7th The Rivergods will be at OpSail 2012, at Fort Trumbull, New London, CT from 3:30-5:00pm, Coast Guard Band and Fireworks to follow. Many more summer dates, too… check out the ‘shows’ page for details.